Welcome to the most comprehensive MK5 GTI forum on the internet. We have a fantastic "How to" DIY section, VCDS register and some of the most knowledgable mechanics/tuners in the business to help you with your pride and joy. Founded in October 2008 we pride ourselves on continuing to be one of the very few car forums that is run entirely free from direct forum sponsorship and vastly supported by member donations. If you are new to the forum please Register and say hello. and visit New Member Intro's and say hello. The forum has been moved to my server . You should notice that its running a little faster and the search is working. Please point out any bugs. When I get a bit of time I think an upgrade is in order with image uploads. Re: 225`s on a 7x17 alloy ? I got some from eBay, I think the brand was "Bimecc"
The only issue is the original covers don't fit on them. I had 10mm spacers on the front so had to cut two of them down slightly, as 40mm was too long, but ok on the 12mm spacers at the rear. Hi guys, anyoen here selling their Depo Projector Headights? I'm looking to pick up a set! Wondering where people are buying their Depo's from? Re: Wing mirror delete blank? Im fairly sure every Golf since the Mk3 has come with 2 mirrors so any blank would have to be custom made. 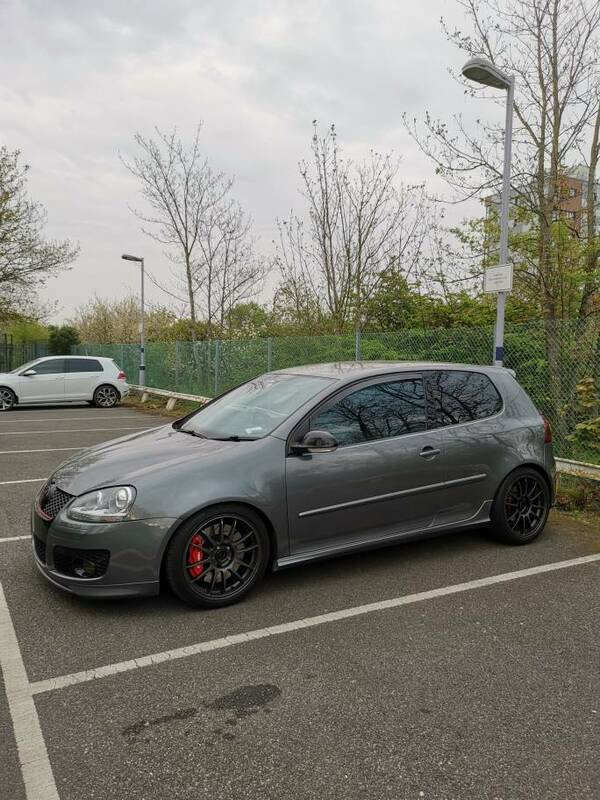 Hi, I'm looking for some standard MK5/6 17 inch GTi alloys. Condition not too important so long as they are straight and have no deep gauges as will get them refurbished. Picked up an Eos cluster soon to be sent off for coding. (Waiting on the pin adapter to arrive). Installed shifter end link and bracket bushings. A noticeable difference in feel. a/c has crapped out and in hoping of I swap out the compressor solenoid wool fix it..
Where can I get the parts to upgrade my standard climate. What size spacers do you want to fit? Need 10mm F and 15mm R for flush spacing with stock wheels. Re: how to get more BHP from my MK5 gti? You’re pretty much max’d out for a k03 but are likely running closer to 280bhp than 300. Will need to go to a hybrid k03 or k04 for more top end power, together with s3 cooler and injectors / bigger fprv. Also interested to learn how to recode a silent alarm? Is there anyway to test the alarm with VCDS? Re: I Got Rev D Diverter Valve fitted ? Get the part from VW and that will eliminate any guess work. Re: Missing cover? Could somone double check for me please? In good condition, slight damage to one of the rear window sections. Comes with carry bag, clips and instructions. Good condition, one of the rear is slightly broken (pictured) but does not affect fitting. Brand new genuine internal boot trim. Bought a few years back for £130 to replace my one as I broke it but never done it. Genuine VW H7 Bulb and fuse kit. Genuine Osir matte carbon fibre quad exhaust trim for R32 bumper. Originally bought off a forum member on here, these retail for $689.99 from Osir in the States. In good condition, couple of scrape marks to the underside but you don't see them when its on the car.